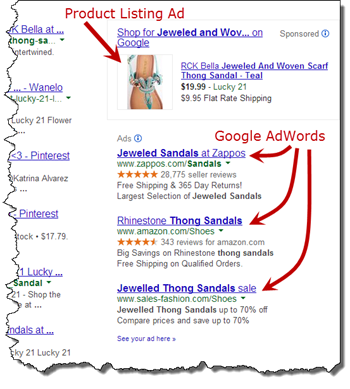 Google's Product Listing Ads are a great way for your products to show up on Google when someone uses search. 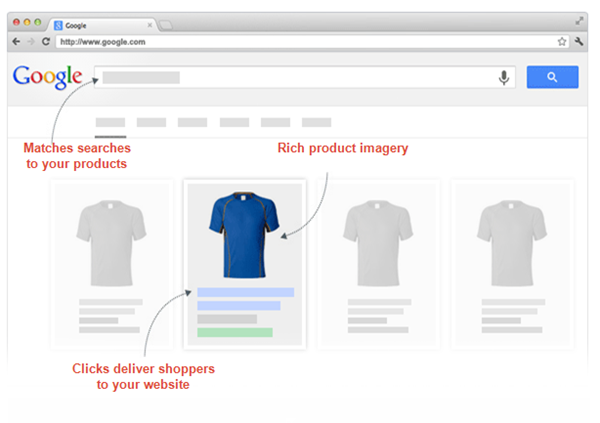 Google automatically shows the most relevant products, along with the product's image, price and product name. When consumers click on an ad they are taken directly to your website. The cost model used for Product Listing Ads is the same as Google AdWords, which is a cost-per-click (CPC). However, Modern Retail has found our clients are having greater success and better returns with Google Product Ads then the more traditional Google AdWords. The improved performance is probably attributed to the fact that Product Listing Ads are typically displayed above AdWords Ads and the cost-per-click is generally lower. Modern Retail will be happy to setup your Google Merchant Center account on your behalf, simply fill out a Support Request and we'll get it done for you. Once your Google Merchant Center account has been configured, you'll need to perform some additional tasks to get your products ready to sell on Google. These tasks are similar but slightly different depending upon which e-commerce platform you are using. Magento does not have a built-in marketplace manager and one need to installed if you don't have one already. The one Modern Retail prefers for most marketplaces is Wyomind Data Feed Manager. Please submit a Support Request if you'd like Modern Retail to get Wyomind installed and configured for you. We've done a lot of installations using this Magento extension and have tweaked it so it really works well with your catalog.